Home » Intermediate » What’s Furniture In Lyrics? 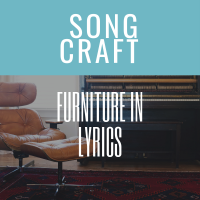 You’ve probably gotten song critiques that suggest you need more furniture in lyrics to give the song a stronger sense of showing versus telling. To do that, you’ll use a combination of external detail and internal detail. But, how much is too much? And, how do you make sure that it still sounds melodic and not like someone describing how to work a can opener – in other words, too instructional? And where the heck are you supposed to get these details?! Great news – I’ve got an external detail process for you to help add “furniture” to your songs, and most importantly, to know when to stop! It’s also a fantastic system for getting past the whole pesky “second verse hell” we’ve all experienced. In her book Popular Lyric Writing: 10 Steps to Effective Storytelling, Andrea Stolpe writes about a technique you may find helpful in avoiding a blank piece of paper, making tea and waiting for the muse to show up on a Sunday afternoon. I’ve written before about Object Writing, which is a term Pat Pattison uses to describe taking a few minutes every day and writing in great detail about an object. Andrea Stolpe encourages the same technique, but uses a slightly different focus. She refers to this songwriting process as Destination Writing. And, you don’t have to choose a process. I would encourage you to try both and see which works the best for you. Who knows, you may employ them each for different outcomes. Take 30 minutes and spend 10 minutes writing down details about 3 items. Once you’ve got a few written, go through with a highlighter and highlight external details. External details are things that describe what’s going on around the speaker/main character of the scene. An internal detail is something that’s going on within the speaker/main character, like what they think about a situation or how they feel about it – heart and mind observations. The perspective is internal. Let’s look at an example I wrote, with the EXTERNAL details highlighted. A couple going through life – an elderly man and his wife are walking down the sidewalk . It is cold and they’re wrapped in heavy coats . He’s holding her hand , as if they’ve forgotten they’re in their seventies now. They’re back in high school – him in his varsity football jacket , and her in her best blue dress . They’ve known each other forever. Maybe they should have dated other people, but back in those days, it was your lot in life to marry when the time came. There were hard times, when the coal dust would seep into his hair and stain their world with nights out and drinking . Women too. Then the baby came , and a young girl became a mother . He came back from the war a different man, not the man she had dreamed about as a little girl – her knight in shining armor : the perfect man to live a perfect life with, not a man who could one day be a better man and lead a better life. How things change! Admittedly, this could probably be more detailed, which will be fairly common when you first start your object/destination writing, but notice that almost all of the words are nouns or verbs. The reason? They can add intense imagery and emotion without long passages, i.e., high value. And, if you only have three verses and a chorus you need as much rich, contributory language as possible to give your song texture, depth and emotional connectivity with the listener. Your external column will become your primary verse content. 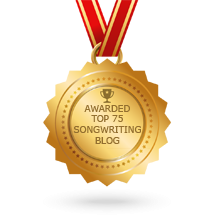 It serves to erase the cliche scenes, bad symbolism and boring elements that so often find their way into songs because of a lack of a disciplined writing process (aka – the “blank paper and have at it” process). The internal column becomes the portion of the lyric that helps define the song, i.e., why it’s worth writing and listening to. One thing you’ll want to keep in mind is that too much external detail or too much internal detail can cause problems. The trick is to find a balance. Stolpe gives a great example in her book Popular Lyric Writing: 10 Steps to Effective Storytelling. If you think you might have a verse with too many internal details, try to punctuate it. Most people unconsciously put punctuation into a sentence when listening, so, if you can’t punctuate a verse, it’s probably too general for someone to follow. First time at your blog. Thank you so much for all the helpful tips! I’m downloading your eWorksheets as I type.